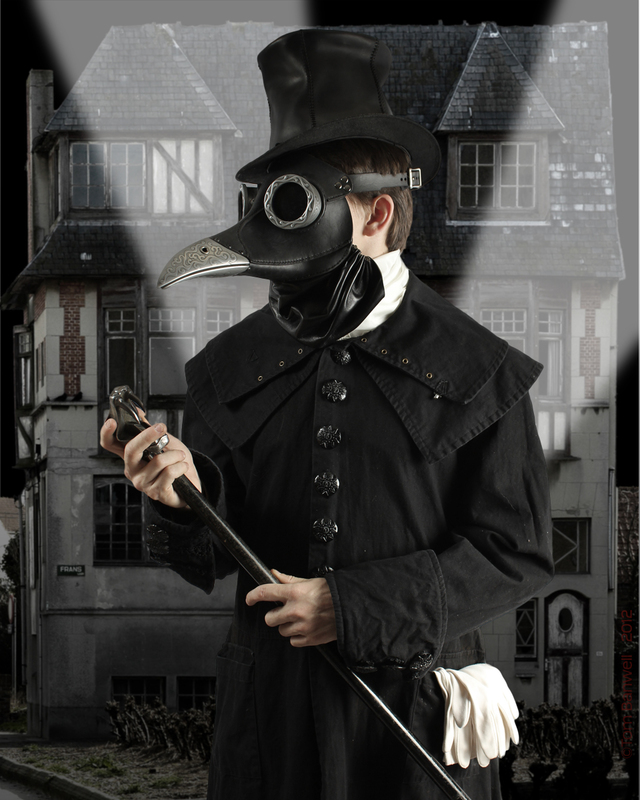 When I was working on my first plague doctor mask, making it as historically accurate as was practical, I kept thinking about how I could design and construct a steampunk version of the mask. 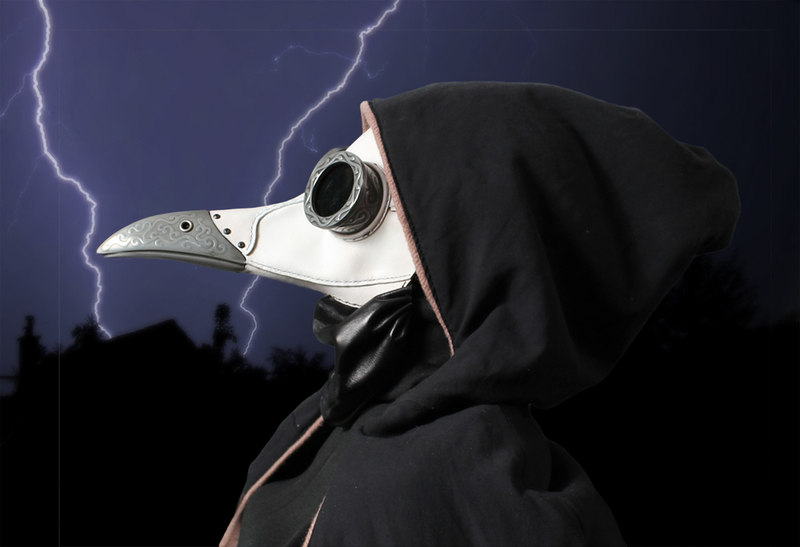 Within a week after finishing the Classic plague doctor mask I began construction on Dr. Beulenpest (which means bubonic plague). I narrowed the beak down somewhat and added a cold cast metal tip, along with leather trim. I built two different eyepieces, both of cold cast metal and with acrylic lenses. I added an additional leather strap and buckle going around the neck to hold the mask tighter to the face, and I hand-stitched a leather surround that runs around the perimeter of the mask, using decorative domed rivets for a stronger look. I also altered the pattern a bit, giving Dr. Beulenpest a sly smile. The leather was dyed violet, then antiqued black over that to give the mask a look of antiquity. 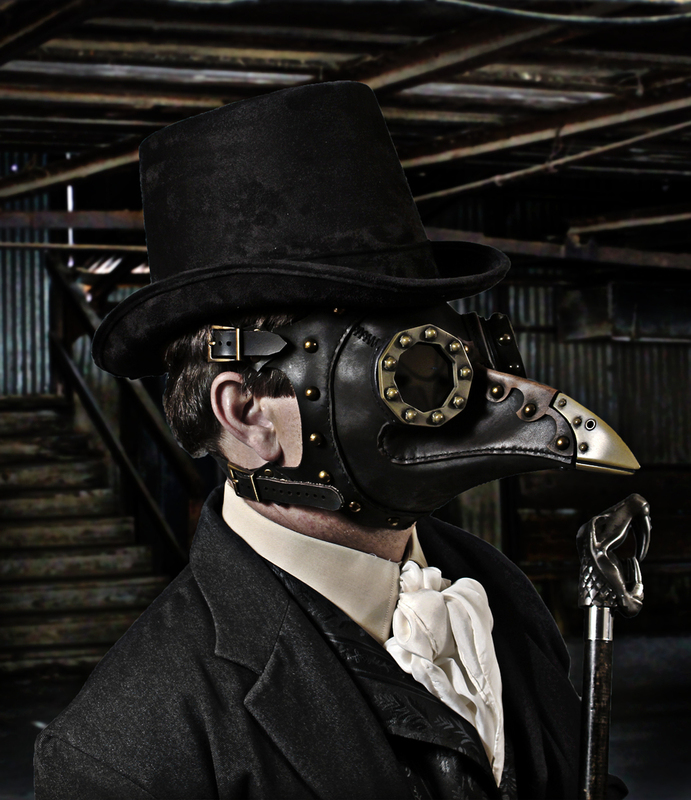 Sometime later I designed a second steampunk plague doctor mask which I named Ichabod, after Ichabod Crane, as the long thin beak reminded me of a crane. The only way I could see to achieve the thinner beak was to have the bottom of it above the bottom of the chin. Since that would look odd I added a gathered piece of soft lambskin as a chin and throat cover. I also extended the beak out to 7½" long. It is made of 4-5 and 5-6 oz vegetable tanned leather, all top grain cowhide. The straps are adjustable by means of three buckles, and the mask will fit a head between a small 21" all the way up to an extra large 24". The beak and eyepieces were cast in cold cast aluminum. They have been polished which brings out the bas relief pattern embellishing them. The beak has two large nostrils which serve as ventilation holes for easy breathing. The mask is all handstitched with waxed thread. The straps are riveted to the mask. The beak is held on with nine machine screws, and the eyepieces are held on using wire. The headband strap has a large piece of foam on the front that goes against the forehead for comfort. The lenses are like dark glasses, and made of 1/8" acrylic. The wearer can look out easily (even in interior lighting), yet no one can look in. The entire mask weighs just 390 gm (less than 14 oz) and is comfortable to wear. The beak was cast hollow so that it is lightweight. The bottom of the beak is just as elaborately embellished as are the sides, plus there are five additional vent holes. We offer Ichabod in both Black and White. Both colors have black throat covers and gray lenses. I felt that a third mask would round out the line, and that I could make one with a more masculine cold cast beak. I named it Miasma. I wanted a strong raptor, or dragon, look. I began three or four times to fashion the beak to my liking, but it always fell short, and I would put the project off to another time. After about a year of this I finally created a beak that I liked. It combined the look of a fierce dragon with that of steel machinery, like a living breathing fantasy piece of steampunk equipment. Wanting to make Miasma different and special, I conceived of making a pair of ventilators that lay alongside the beak, behind the cold cast tip. I felt this was the perfect opportunity to use a stretched leather technique to add visual interest. It took me many more weeks to work out just how to execute and attach these so that they were a component that made a better mask.